Naples excites strong reactions among those who live here and those who visit us. Some see Naples as a dirty and dangerous city while others find it a place of inexhaustible interest. It is, in fact, both of these things. There's no doubt that Naples crawls with pickpockets, bag snatchers and sneak thieves, both native and, increasingly, foreign (Kosova and Romania spring to mind), who prey on tourists as well as Neapolitans. Naples is also home to excellent museums, a fine national library, a wealth of baroque churches, great food and one of the most beautiful seafronts in the world. 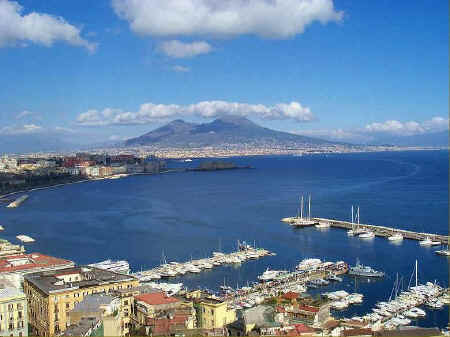 Nearby are Vesuvius and Pompeii, as well as the islands of Capri and Ischia, and the Sorrento peninsula. In the final analysis, it would be a major error to miss any opportunity you might have to spend some days or weeks here in Naples. The central and main piazza of Naples is the Piazza del Plebiscito. It was initiated by the Bonapartist King Joachim Murat and finished by the Bourbon King Ferdinand IV. It is bounded on the east by the Royal Palace and on the west by the Church of San Francesco di Paola, with the colonnades extending to both sides. 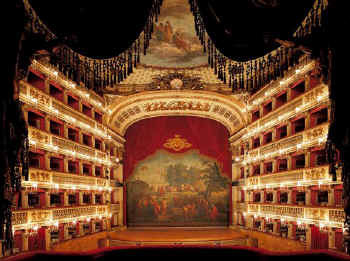 Nearby is the Teatro di San Carlo, which is the oldest and largest opera house on the Italian peninsula. Directly across from San Carlo is Galleria Umberto, a shopping centre and active centre of Neapolitan social life in general. Aside from the main piazza there are the Piazza Dante and the Piazza dei Martiri. The latter is somewhat controversial: it originally just had a memorial to martyrs but in 1866, after the Italian unification, four lions were added, representing the four rebellions against the Bourbons. Naples is well-known for its historic castles: the ancient Castel Nuovo (Maschio Angioino) is one of the most notable structures of Naples. It was built during the time of Charles I, the first king of Naples. Pope Celestine V resigned as pope in a hall of the castle, and following this Pope Boniface VIII was elected pope here by the cardinal collegium, and immediately moved to Rome. 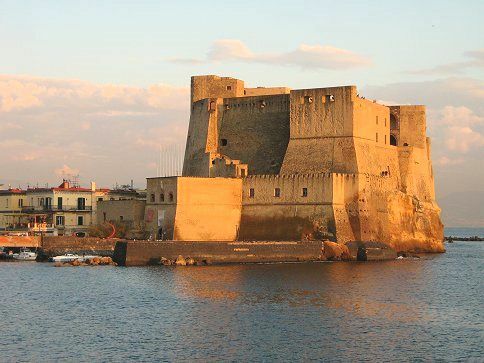 The castle which Nuovo replaced in importance was the Norman Castel dell'Ovo. Its name means Egg Castle and it is built on the tiny islet Megarides, where the Cumaean colonists founded the city. The third castle of note is Sant'Elmo which was completed in 1329 and is built in the shape of a star. During the uprising of Masaniello, the Spanish took refuge in Sant'Elmo to escape the revolutionaries. 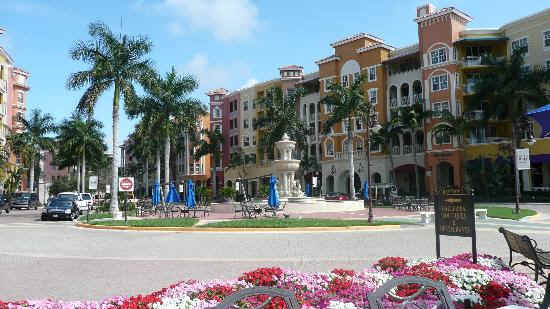 A great alternative to staying in Naples! 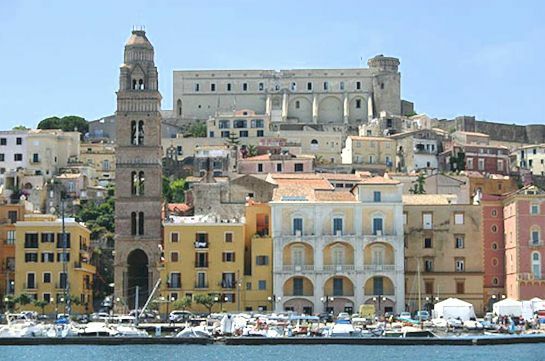 If you're planning to explore Naples, the Amalfi coast and places nearby in southern Italy, why not stay on the coast at the pretty fishing port of Gaeta with easy access to beautiful beaches, economical accommodation, quietness and clean air? Naples is an hour away by fast train, and you can do day excursions of the Amalfi coast by car. Even better - Enza Volpe is available organise your accommodation and all of your tours, including Pompeii and the island of Capri, from her base in Gaeta. Let Enza do the worrying - you just relax and enjoy! 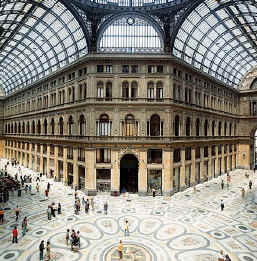 Naples hosts a wealth of historical museums and some of the most important in the country. The Naples National Archaeological Museum is one of the main museums, considered one of the most important for artifacts of the Roman Empire in the world. It also hosts many of the antiques unearthed at Pompeii and Herculaneum, as well as some artifacts from the Greek and Renaissance periods. The Museo di Capodimonte was previously a Bourbon palace and is now a museum and art gallery, probably the most important in Naples. The art gallery features paintings from the 13 C to the 18 C including major works by Simone Martini, Raphael, Titian, Caravaggio, El Greco and many others, including Neapolitan School painters Jusepe de Ribera and Luca Giordano. The royal apartments are furnished with 18 C furniture and a collection of porcelain and majolica from the various royal residences: the famous Capodimonte Porcelain Factory was just adjacent to the palace. The Certosa di San Martino was formerly a monastery complex but is now a museum and remains one of the most visible landmarks of Naples. Displayed within the museum are Spanish and Bourbon-era artifacts, as well as displays of the nativity scene, considered to be among the finest in the world. Pietrarsa railway museum is located in the city: Naples has a proud railway history and the museum features, amongst many other things, the Bayard, the first locomotive in the Italian peninsula. Other museums include the Villa Pignatelli and Palazzo Como, and one of Italy's national libraries (the Biblioteca Nazionale Vittorio Emanuele III) is also located in the city. For a fine range of hotels in Naples, Ischia and Capri, bookable on-line - click here. Offered via the most reliable on-line booking system in Italy. The Catholic faith is highly important to the people of Naples and there are hundreds of churches in the city. The Cathedral of Naples is the most important place of worship in the city and, each year on 19 September, it hosts the Miracle of Saint Januarius, the city's patron saint. In the miracle, which thousands of Neapolitans flock to witness, the dried blood of Januarius is said to turn to liquid when brought close to relics said to be of his body: this is one of the most important traditions for Neapolitans. San Gennaro dei Poveri was founded in 1667 by the Spanish as a hospital for the poor which is still in existence today. It was a forerunner of a much more ambitious project, the gigantic Bourbon Hospice for the Poor started by Charles III. This was for the destitute and ill of the city. It also provided a self-sufficient community where the poor would live and work. Today it is no longer a hospital. Santa Chiara includes the Church of Santa Chiara, a monastery, tombs and an archaeological museum. The monastery was built in 1310-1340 by King Robert of Naples, who is also buried here. The original church was in traditional Provençal-Gothic style, but was restored in the 17- 18 C in Baroque style by Domenico Antonio Vaccaro. The sober façade has a massive appearance, softened somewhat by the large central rose-window. The bell tower, separated from the main building, was begun in 1328 but was completed only in Renaissance times. The simple interior houses, behind the high altar, the tomb of King Robert and, in the side chapels, those of the Bourbon king of Naples, Francis II and his consort Marie Sophie, as well as of Queen Maria Cristina of Savoy (wife of Charles Felix of Sardinia). 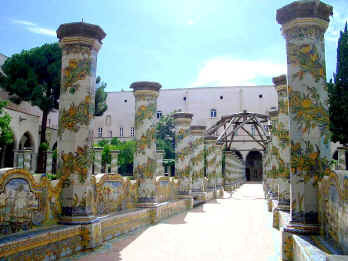 The cloister of the Poor Clares, transformed in 1742 by Vaccaro with the addition of majolica tiles in Rococco style, should not be missed. The Nuns' Choir houses fragments of frescoes by Giotto. The Villa Comunale, previously known as the Royal Garden because it was founded by the Bourbon King Ferdinand IV in the 1780s, is the most famous public park in Naples. The second most important park is Parco Virgiliano which is very green and has views towards the tiny volcanic islet of Nisida and beyond to Procida and Ischia. The park is named after Virgil whose tomb is thought to be nearby. There is also a small but popular green space around the Naples Aquarium (Stazione Zoologica) on the waterfront. Pubblicizza qui la tua attività e vedi ora i risultati! Vorresti pubblicizzare la tua attività su questo sito web per Napoli e ricevere traffico in entrata dalla nostra rete di più di 50 portali relativi? Clicca qui per ulteriori dettagli in merito alla nostra soluzione integrata per una presenza su internet piena di successi. Naples Napoli © ammonet InfoTech 2009 - 2018. All rights reserved.